→Are You Making The Right Offer? Are You Making The Right Offer? Do you want to drive more traffic and make more sales? If you answered yes, it is vitally important for you to answer the question "are you making the right offer?" By making the wrong offer to the wrong person at the wrong time, you virtually guarantee that people will not buy, will not opt-in, and will not recommend you to their friends. On a more positive note, this is one of the easiest marketing problems to solve. All you need to do is understand the types of traffic AND match what you offer to each one. Let's get started helping you get more traffic and sales! By now you probably know about the three types of traffic. If you are not familiar with them, please stop reading and take time to watch this short video. ?It will open in a new tab for your convenience. Click here for the Traffic Types video. Okay, so you know that there are three types of traffic. And you understand that it takes different skills to drive each type of traffic. But did you know that the biggest problem with increasing conversions once you have traffic is making the wrong offer at the wrong time? It's true. In fact, it's so important I will repeat it. If you agree, please share it. The key to increasing conversions is making the right offer at the right time to the right person. This map will help! So how do you know what offer to make and when to make it? Happily, I have a map that will help you! Here is an image of the map. You can download a copy below if you want to have one handy. I strongly recommend you do that. CLICK HERE TO GET THE MAP FREE! Let's look together at each type of traffic and at what offer types are proven to work best for them. As you know, cold traffic means people who do not know you yet. They are in what we call the "Awareness" stage. In other words, your job is to make them aware that you exist and that you can help them solve their problem. That there IS a solution to their problem. That you exist or what you offer. That your offer can solve their problem. That you are the best possible choice for solving their problem. If you do not have traffic, a list, or sales now that list is your mission statement. Selling comes down to this - finding people with a problem and making them aware that we exist and can solve their problem. Find strangers who have a problem you can solve and let them know you exist, that you care, and that you can solve their problem. If you do that often enough, you will grow a massive online business. Everyone who has a problem wants to solve that problem. So what types of offers work well to convert people from strangers to people who are evaluating you and your solution? Focus on these things and you will do well. Blog posts - Nothing works better than a great blog post to let people know that you know what you are talking about. In a blog post you can express your personality, share helpful information, and even build your list! Social Media Updates - These teasers reach out to people who might not visit your blog. Content Videos - Share openly using video to teach something a person can do today and spread the word on YouTube and other channels. Podcasts - The popularity of podcasts make them the perfect vehicle for reaching new audiences. Podcasts are easy and free to produce. Case Studies - People love hearing about how others solved their problems. Use case studies to show how solutions happen and how you can help. Research Papers - Deep research papers create amazing authority. If you are an expert in a topic this is often a great starting point. One key to success with these strategies is to keep doing them. Far too many people write five blog posts and expect the sales to come pouring in. One happy way to create leverage for yourself is to repurpose your content so you create the content once and profit from it many times. For example, you can produce a case study as a blog post, a social media post, a content-rich video, and as a podcast too! If you need more traffic to your blog or website, these are the tactics that will help you get there. As you know, warm traffic simply means people who are aware of you but have not made a commitment of any kind. These folks are in the "Evaluation" stage. They may have visited your blog, seen your ad, or consumed some free content that was not gated. NOTE: By "gated" I mean they did not need to opt in to get the content. They have moved out of Awareness (they are now aware of you) and firmly into evaluating if they can trust you enough to make a commitment. You will know they trust you enough to commit when they take one of these two actions. They commit with their time. They commit with their money. You see, those really are the two ways that people commit to us. They give us of their time or of their money. And these are the very signs you look for. Specifically, you are looking for "micro commitments" at this point. Major commitments (like buying your core product or upsell) come later. In fact, when working with clients I often ask questions to uncover just how many people are making such small commitments. How much traffic did you get in the last 30 days? How many people joined your list in the last 30 days? How many blog comments or social shares have you received in the last 30 days? By knowing numbers such as these it's easy to see how engaged their audience is and if they are moving naturally down the buying continuum. If you are trying to sell products online, remember this important fact. The natural progression of a visitor is to become a subscriber, buy a low-priced product and then buy your more expensive products. The list below are the most proven ways known to get Warm Traffic to move into the Hot Traffic category, which is where you want them to be! Free or Paid Webinars - When a person registers for your webinar they are giving you the gift of their time. Honor it, and provide massive value free, and you move them quickly along the buying continuum. Lead Magnets - A lead magnet is a free gift given in exchange for someone joining your list. When they take up your lead magnet they are committing with their time. Quiz or Survey - Quizzes and surveys work incredibly well when doing digital marketing. In fact, it's a win-win-win. The reader wins because they learn something. You win because you get the opt-in AND valuable segmentation information at the same time. Flash Sales - Flash sales are short duration sales where a product is offered at a low price. The discount is often 50% or more, which gets those on the fence to make the jump from non-buyer to buyer.? Low Dollar Entry Level Products - Often called "tripwire" products, these entry-level products help people try your products without making a big money commitment. The best entry-offer products are "splinters" of your core product. Product Demo - Product demos are often offered to cold traffic, which can be a big mistake. Afraid of spam, the cold audience often uses a fake email to register. To solve this problem, and close more sales, run demo offers to warm traffic instead. White Paper - A white paper is similar to a deep research report but a little less intimidating for the reader. Many high-quality PLR products can be positioned as white papers, giving them more authority. Branding Videos - Notice that there are not selling videos. Instead, they are designed to showcase your brand and create authority. Make these short, fun, and use great music to create a winning video. Free or Paid Book - If using a paid book with warm traffic, make sure the price point is entry-level. I don't recommend completely free books here but a "free with shipping" approach works very well. A La Carte Services - If you provide services consider using a one-off service to get your foot in the door. When you see a vet offering low cost vaccinations in the parking lot of a major retailer, you are seeing this idea in practice. Software or Plugin - A free version of your plugin, with an easy upgrade path works very well with warm traffic. If you offer a low-cost version that can work equally well. Free Trial - A free limited-time trial of your complete product works very well to convert non-buyers into buyers. The key here is to give them the full version. Providing a "limited feature" version stopped working years ago and now alienates most customers. You know that hot traffic means people who have made a commitment to you on some level. They have committed with their time or their money. Now it's time to see how to help this person take the next step. Selling online follows the same model as healthy, normal, human relationships, so the next step should be natural and not forced. Just make these offers to people you know are in the "hot traffic" category and know that those who have the need will respond. 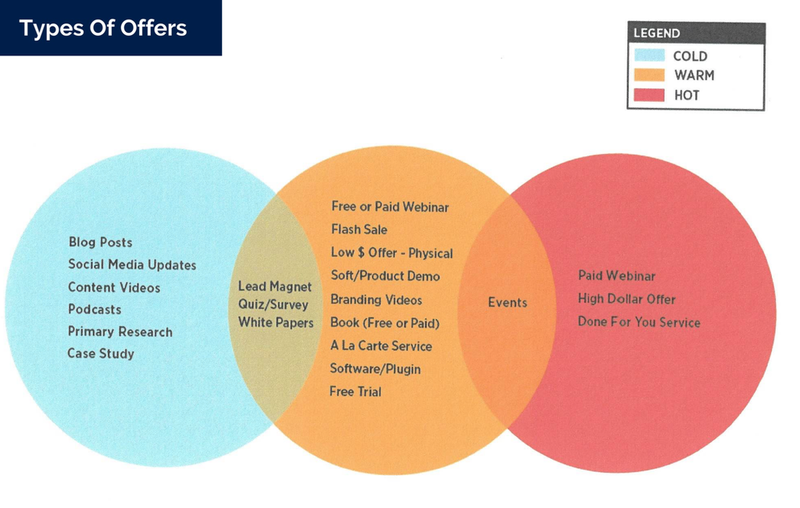 Paid Webinar - Will people pay for a webinar? They will if you deliver value and price it right. I have done this for years and only had one customer complain that he was paying for a webinar. Keep the value high and this works very well. High Dollar Offer - Hot traffic needs your best offer. They need the highest level of service you offer and they will pay for it. They know, like, and trust you and so this is the natural next step. The best offers offer buyers speed or automation. Done For You Services - Many buyers simply don't have the time or technical skills to do what needs to be done. These good people are perfect for your done-for-you offers. If you don't have a DFY service now, create one and watch your profits soar. Some offers work equally well when presented to more than one group. Since we have covered all the offers above, I will simply list which make good "cross over" offers so you can use them that way too. YIKES! I just looked at realized we are over 1800 words already. The goal of this article is simple - to give you a guide to follow and help you think about traffic in a new way. "You don't have a traffic problem. You have an offer problem." When I share that with clients they sometimes push back a little and say their offer is great but their traffic is lousy. "If you were giving a $100 bill to every person who would join your list, how many people would sign up?" The answer is almost always the same ... ALL OF THEM! While I can't promise you that all of the people who visit your blog or landing page will sign up, I can promise you this. If you use what you learned in this article you will grow your list faster, sell more products, recover your advertising costs faster, and grown your online business better than ever before. I'm sure you are not surprised to hear me say that these are beautiful things indeed! Thanks Charlie for explaining this in detail. There are some great insights that you have shared which I can use. I’m happy you found it helpful! Thanks for leaving a comment.